Dutched cocoa powder provides a deep, dark reddish hue to baked products. What is Dutched Cocoa Powder? Cocoa powder is a flavorful ingredient used in baking. To make cocoa powder, the cocoa seeds are dried in a factory and then crushed into pieces called nibs. Chocolate liquor is then produced from these nibs. After extracting cocoa butter from the chocolate liquor, the remaining solids are cocoa powder. Dutched cocoa is obtained by treating this cocoa powder with alkali. This process makes a darker and richer brown color. Cocoa powder is a brown powder obtained after cocoa butter is expelled from chocolate liquor. Cacao trees produce cocoa beans, from which chocolate liquor is extracted from. Most of the chocolate in this world comes from West Africa and South America. 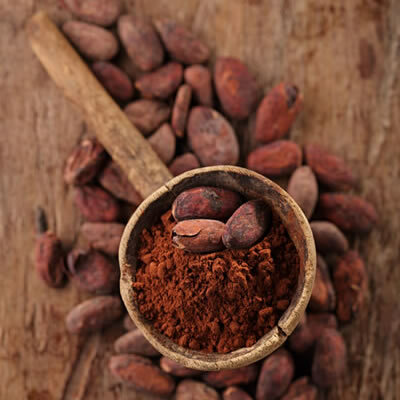 Cocoa powder is a substance produced from the seed of the cocoa tree. This fruit-bearing tree grows large fleshy fruits continuously throughout the year along its trunk. The location of the seed pods on the trees, each containing 30-50 seeds, make it an easy product to harvest by hand. In fact, it is estimated that during harvest, a worker can pick around 650 pods per day. That is enough seeds to make about 65 pounds of chocolate. Alkalized chocolate provides the deep, dark reddish hue to baked products like Devil’s Food Cake. By using potassium carbonate, or other alkali, to increase the pH of the cocoa powder, the ‘Dutching’ process produces a uniquely darker and richer cocoa powder. Originated in the Netherlands, the Dutching process neutralizes the acids in the chocolate and could result in as high as pH 8.8. 5-15% of dry flour weight. Used mostly in bread, cake and cookie production. When using dutched chocolate, remember that the batter becomes more alkaline. The chemical leavening system needs to consist of more acids, or acids that can react with the alkalinity, to produce adequate gassing. Without this, the result would be a dense and gummy cake. There are many health benefits associated with cocoa powder that range from heart health to decreases in LDL cholesterol. It is also fairly low calorie. This powder is typically mixed back in with cocoa butter to make chocolate products, but can also be used as it to make a variety of dishes.